Povezava na slovensko verzijo članka. 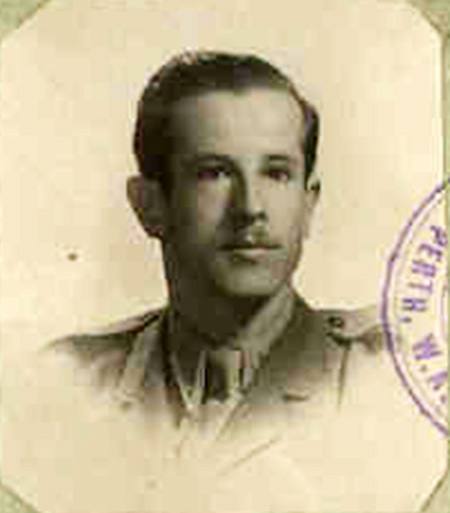 My father, Joze’s first sight of Australia was the Port of Fremantle on 22nd April, 1948. For many, their first glimpse was disappointing. The wharf was a row of tired old warehouses and wool sheds made from wood and corrugated iron. It must have dented the confidence of even the most optimistic of passengers. It was the beginning of postwar immigration to bring displaced persons from Europe. The Australian Government agreed to include such people in its migration program. For a country whose immigration policies had always preferred people of Anglo-Celtic heritage, it was a significant political and cultural shift. Joze Zigmund (1921-2002) had left behind the Displaced Persons Camp at Cinecittà in Rome where he had lived since the end of the war. For a few years the famous Italian movie studio was a refugee camp for some of the thousands of displaced people in war-ravaged Italy. On arrival Joze completed documents required under Australian law (Aliens Act and Aliens Control). Only non-British passengers were deemed to be “aliens”. The documents reveal two links to Slovenia. 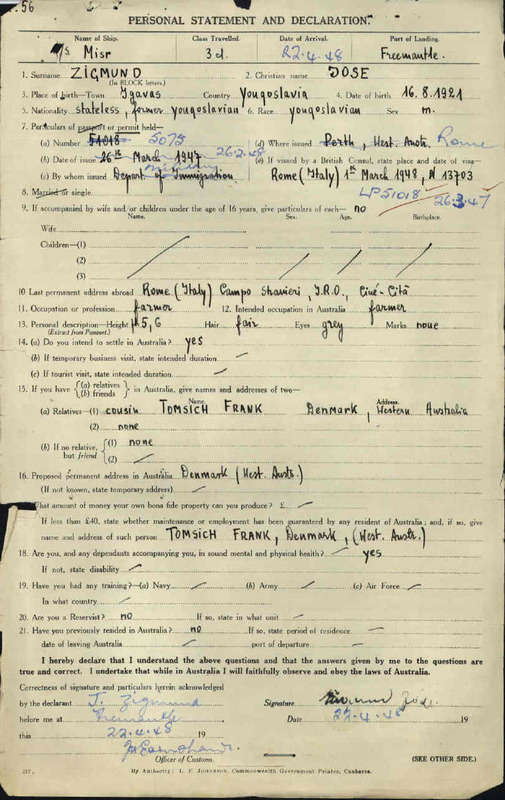 ‘Personal Statement and Declaration’ states that Frank Tomsich (Franc Tomsic) had sponsored Joze, without which he many not have been allowed entry into Australia. As Joze had nothing but his clothes Franc provided a guarantee to the Australian government that he had full responsibility to either find employment for Joze or to maintain him. Franc Tomsic (1907-1994) was born in Knezak 25 Dol. Brumen and had been in Australia since 1927. They were distant cousins and if they had met in Slovenia Joze would have been no older than a boy of 5 years old. 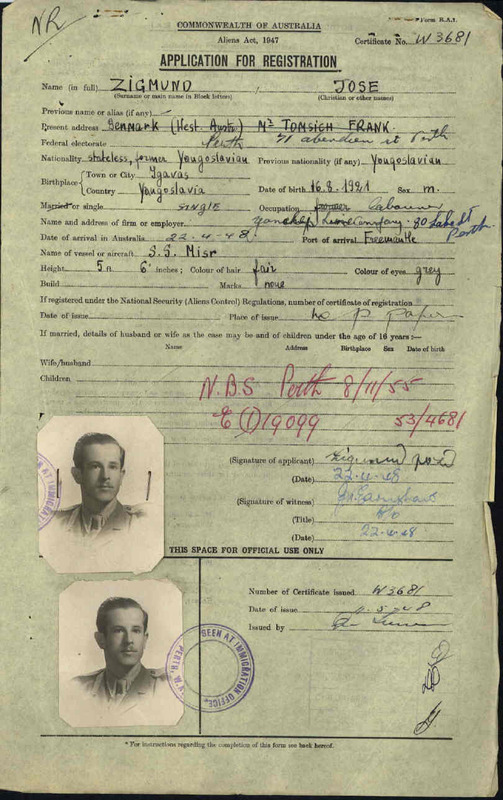 ‘Application for Registration’ states that Joze already had a job waiting with “Yanchep Lime Company “. The company was owned by Jozef Hribar (1903-1978) who employed other men from Loska Dolina and Cerknica. The connection between Jozef Hribar and Joze Zigmund was Zerovnica. Joze’s father, Franc Zigmund (1882-1942) was born in Zerovnica 45. Krasevc and Jozef Hribar was from next door at Zerovnica 46 Dovičevi. Based on this relationship Joze had a referral for the job. Hribar operated lime kilms based 50kms from Perth city and surrounded by virgin bush. “Yes they did. I was under the impression that the ancient Egyptians had more modern lime kilms than the ones I saw. But anyway that was the end of the road so there was no other alternative but to get stuck into the work that I was given…….. I found it very hard but I had no other option. I didn’t know any english what so ever so I had to stay where I was”. Sixty five years later in Perth, a city of 1.75 million people, there is still a link between the surnames of Zigmund and Hribar. One of Hribar’s grandsons and a Zigmund daughter work together in the same profession and in the same office. Joze never forgot his cousin Franc’s sponsorship. The only time I ever saw my father cry was at Franc’s funeral.